Showing items in category Cape of Good Hope, sorted by newest listed first. 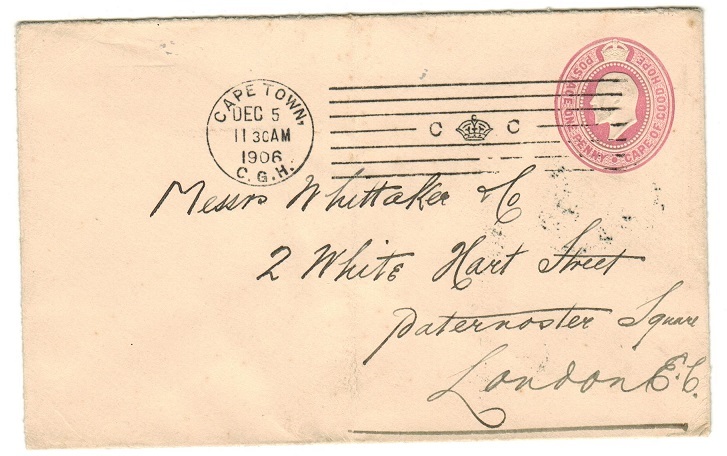 CAPE OF GOOD HOPE - 1909 inward 'UNKNOWN' h/s'd cover from BULAWAYO. 1909 (JUL.18.) inward cover from Rhodesia (ex part reverse flap) bearing 1d adhesive tied BULAWAYO with PORT ELIZABETH arrival cds but undelivered and struck UNKNOWN in blue ink. CAPE OF GOOD HOPE - 1892 1d pink PSE uprated with 2 1/2d on 3d surcharges at DRAGHOENDER. H&G 2a. 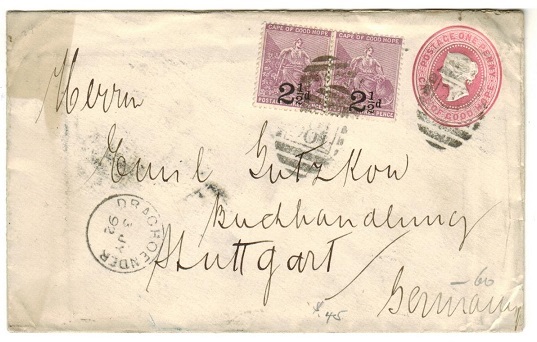 1892 1d pink on heavy white (curved flap) postal stationery envelope (size b) addressed to Germany bearing a fine pair of the 2 1/2d black surcharge on 3d pale magenta adhesive (SG 35) tied by '581' duplex with DRAGHOENDER 'proving' cds at left dated 3.JY.92. H&G 2a. CAPE OF GOOD HOPE - 1903 1d pink PSE uprated to UK at POKWANI-CAPE. H&G 5c. 1903 1d pink on cream postal stationery envelope (size b-curved flap) addressed to USA and bearing additional 1/2d and 1d adhesives tied POKWANI-CAPE. On arrival struck FORWARDED having been re-addressed. H&G 5c. CAPE OF GOOD HOPE - 1906 1/2d rate postcard use with scarce CONWAY STATION receiver cds. 1906 (JA.15.) 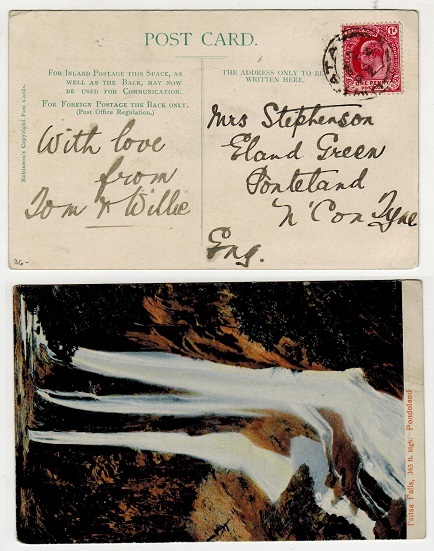 use of picture postcard addressed locally depicting 'Victoria Falls' bearing 1/2d adhesive tied BELMONT/CGH with rare CONWAY STATION arrival cds at left. CAPE OF GOOD HOPE - 1882 1d reddish brown PSC (Private Print) to UK used at CRADDOCK. H&G 2. 1882 1d reddish brown on cream postal stationery postcard addressed to USA cancelled by CRADOCK/C.G.H. cds dated SP.11.99 and pre-printed on reverse side for 'Butler Bros' (Book Store) with illustration. A scarce privately printed use of this stationery. H&G 2. 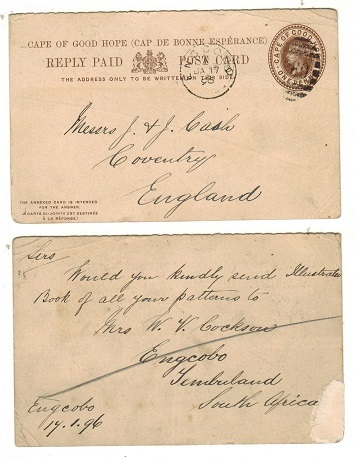 CAPE OF GOOD HOPE - 1892 reply section of the 1d+1d brown PSRC to UK used at ENGCOBO. H&G 7. 1892 reply section of the 1d+1d brown on cream postal stationery reply type postcard addressed to UK cancelled by '880' duplex with ENGCOBO cds at left dated JA.17.96. A scarce use of this reply section and fine 'proving' use. H&G 7. 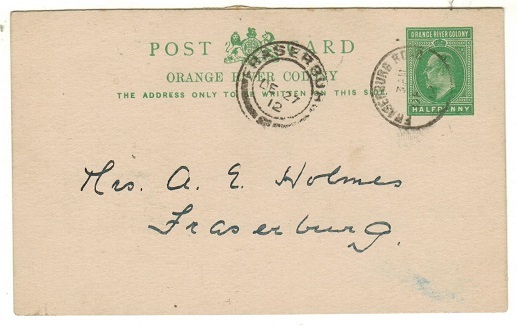 CAPE OF GOOD HOPE - 1900 1d rate cover to Ireland used at ORANGE RIVER. 1900 (NO.25.) cover addressed to Ireland bearing 1d adhesive tied by ORANGE RIVER/CGH cds. 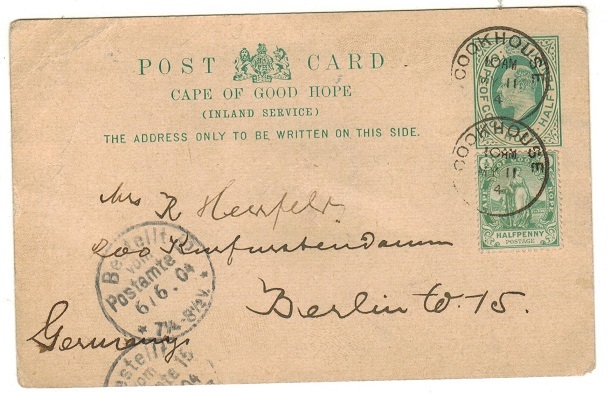 CAPE OF GOOD HOPE - 1912 inward use of 1/2d green PSC (H&G 35) used at WEST KENSINGTON in the UK. 1912 (JU.8.) 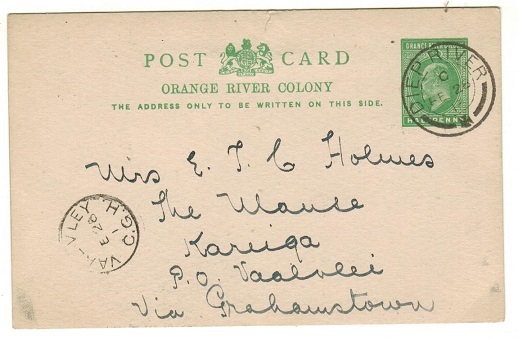 inward use of 1/2d green postal stationery postcard of Orange River Colony (H&G 35) from London UK cancelled by WEST KENSINGTON cds with VAAL VLEY arrival. A unusual use of this stationery from the UK without taxation. CAPE OF GOOD HOPE - 1908 1d rate postcard use to UK used at KROOMIE SIDING. 1908 (FE.17.) use of picture postcard addressed to UK depicting 'The Beach at Xmas East London' bearing 1d adhesive tied KROOMIE SIDING. CAPE OF GOOD HOPE - 1905 1d rate postcard use to UK used at WOODSTOCK STATION. 1905 (JU.7.) 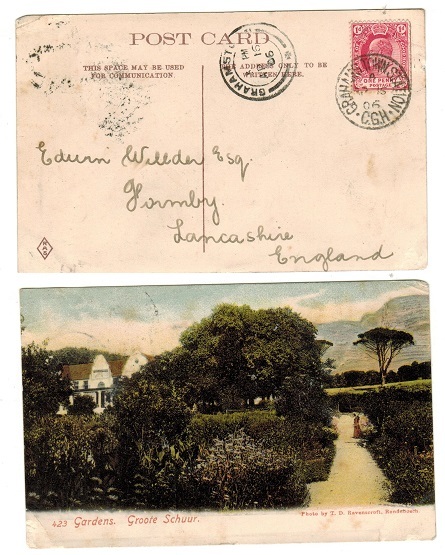 use of picture postcard addressed to UK depicting 'Summer House at Groote Schuur' bearing 1d adhesive tied by squared circle WOODSTOCK STATION cds. CAPE OF GOOD HOPE - 1914 use of 1/2d green 'ORC' PSC used at WOODSTOCK. 1914 (JAN.3.) 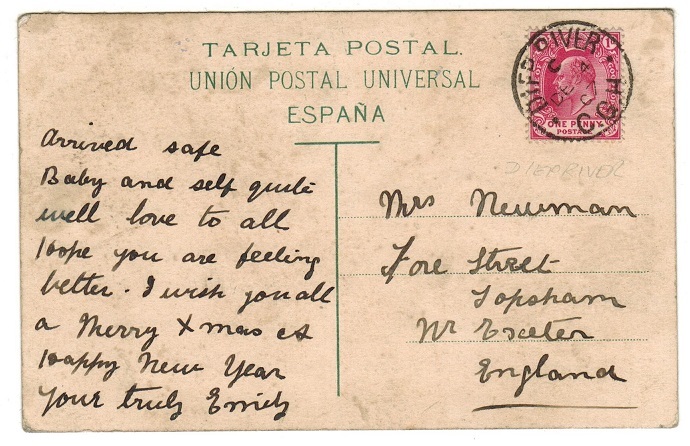 use of Natal 1/2d green postal stationery postcard (H&G 14) addressed locally and cancelled by WOODSTOCK/S.AFRICA cds. A Inter-provincial usage. 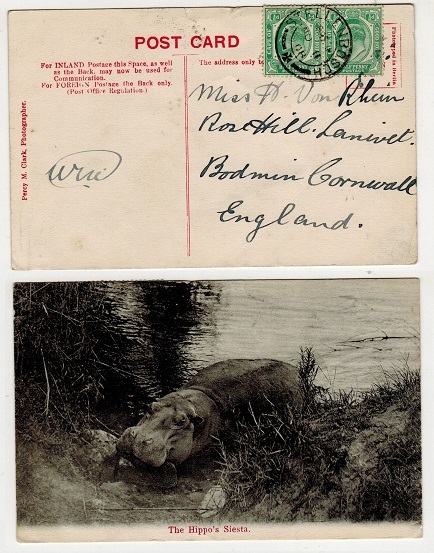 CAPE OF GOOD HOPE - 1913 1/2d green 'ORC' PSC used at DIEP RIVER. 1913 (FE.26.) use of 1/2d green postal stationery postcard of Orange River Colony (H&G 35) addressed locally and cancelled by DIEP RIVER. cds. A Inter-provincial usage. CAPE OF GOOD HOPE - 1912 use of 'ORC' PSC used at TYLDEN. 1912 (JA.10.) use of 1/2d green postal stationery postcard of Orange River Colony (H&G 35) addressed locally and cancelled by TYLDEN/C.G.H. cds. Inter-provincial usage. 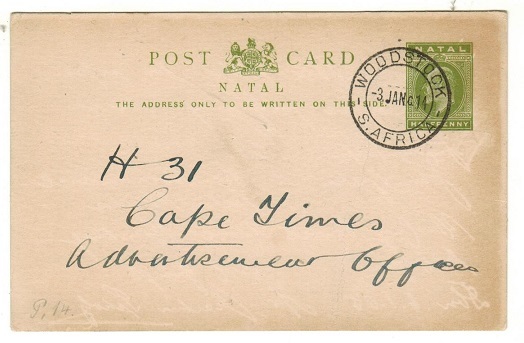 CAPE OF GOOD HOPE - 1912 use of 1/2d green 'ORC' PSC used at ST.MATTHEWS. 1912 (DE.13.) use of 1/2d green postal stationery postcard of Orange River Colony (H&G 35) addressed locally and cancelled by ST.MATTHEWS/C.G.H. cds. Inter-provincial usage. CAPE OF GOOD HOPE - 1912 use of 1/2d green 'ORC' PSC used at FRASERBURG ROAD. 1912 (DE.27.) use of 1/2d green postal stationery postcard of Orange River Colony (H&G 35) addressed locally and cancelled by FRASERBURG ROAD cds. Inter-provincial usage. CAPE OF GOOD HOPE - 1910 1/2d rate local postcard use used at TOOTABI. 1910 (AP.29.) 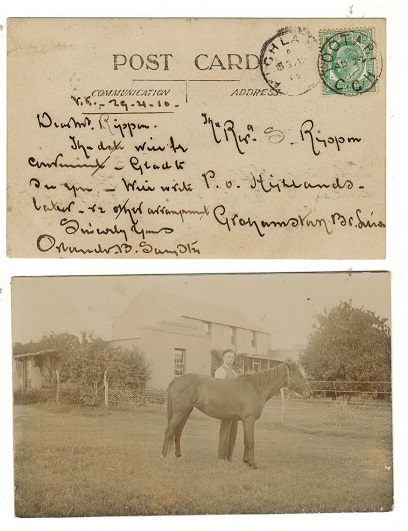 use of picture postcard addressed locally to Grahmastown depicting a real photo of horse in field with owner bearing 1/2d adhesive tied TOOTABI/CGH with HIGHLANDS arrival cds at left. A scarce strike. CAPE OF GOOD HOPE - 1907 1/2d rate local postcard use used at OCKIEP. 1907 (SP.4.) 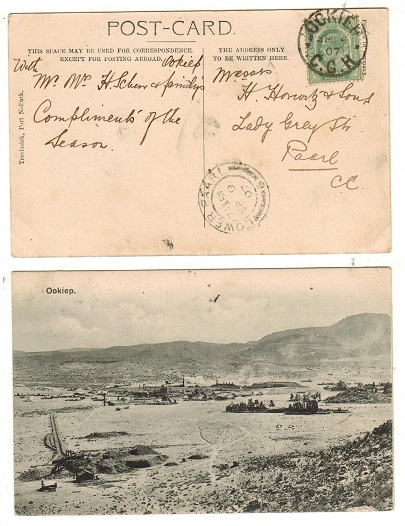 use of picture postcard addressed locally to Paarl depicting 'Ookiep' and bearing 1/2d adhesive tied OCKIEP/CGH and with LOWER PAARL arrival cds below. The latter not and easy strike to find. CAPE OF GOOD HOPE - 1907 1/2d rate local postcard use used at EMBINZANA. 1907 (JY.17.) 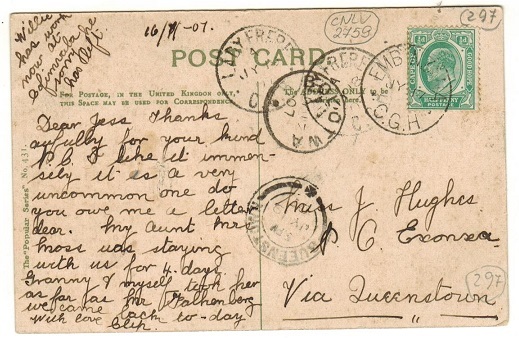 postcard addressed locally (comic) bearing 1/2d green tied by s/r EMBINZANA/ C.G.H. cds. (Spelt with A instead of I). Interesting since the Putzel handbook mentions this only occurred in 1924. 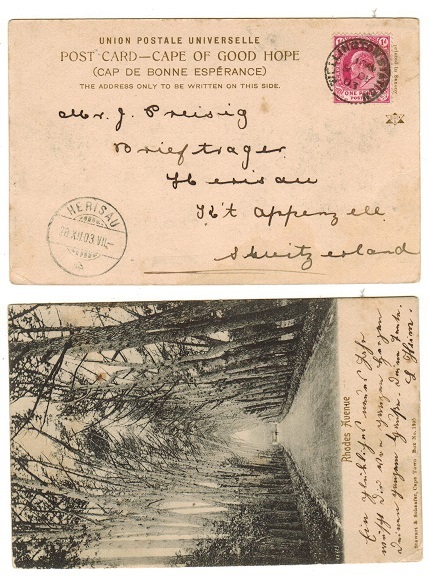 CAPE OF GOOD HOPE - 1902 1d rate postcard to Graff Reint with PASSED PRESS CENSOR h/s. 1902 (AP.1.) 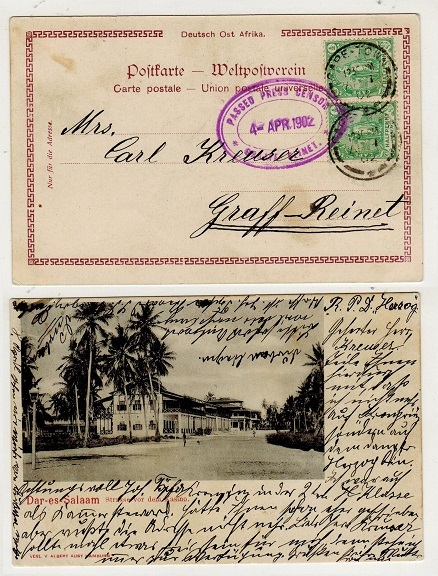 use of 'Deutsch Ost Afrika' postcard addressed to Graff Reinet depicting 'Dar Es Salaam-Strasse Vor Dem Kasino' inset bearing Cape 1/2d pair tied CAPE TOWN and with violet oval PASSED PRESS CENSOR/GRAFF REINET h/s applied at left. CAPE OF GOOD HOPE - 1912 'Inter Provincial' use of Transvaal 1/2d green PSC used at VAAL VLEY. 1912 (JA.2.) 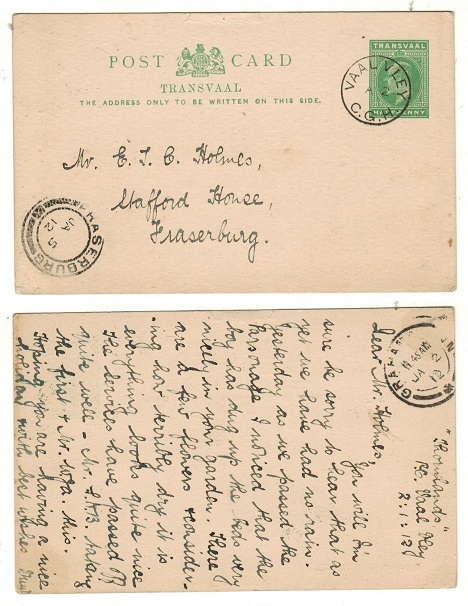 use of Transvaal 1/2d postal stationery postcard (H&G 11) addressed to Fraserburg and cancelled by s/r VAAL VLEY/C.G.H. cds. A nice Inter-Provincial use. CAPE OF GOOD HOPE - 1912 'Inter Provincial' use of Transvaal 1/2d green PSC at GRAHAMS TOWN. 1912 (AUG.15.) 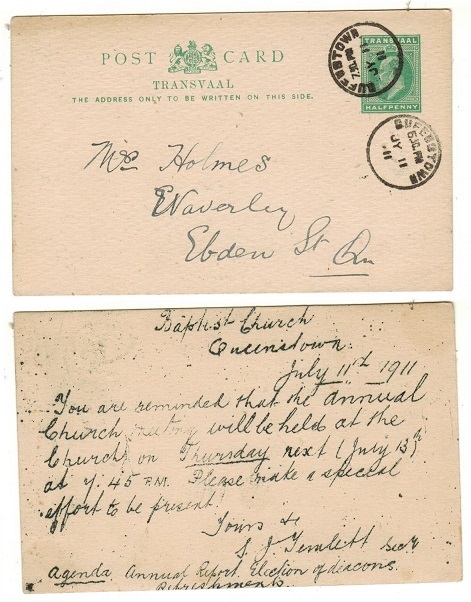 use of Transvaal 1/2d postal stationery postcard (H&G 11) addressed locally and cancelled by GRAHAMS TOWN/C.G.H. cds with VAAL VLEY arrival. A nice Inter-Provincial use. 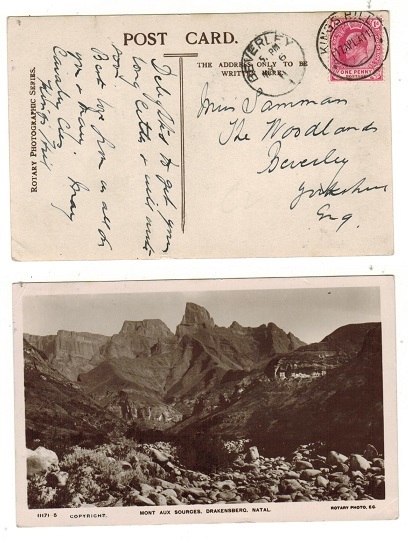 CAPE OF GOOD HOPE - 1911 1d Transvaal on postcard used at KINGS WILLIAMS TOWN. 1911 (DE.4.) 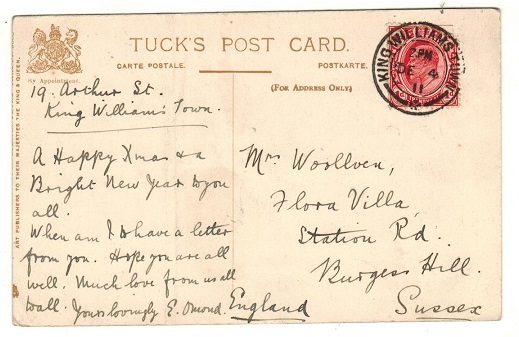 use of picture postcard addressed to UK bearing Transvaal 1d adhesive tied by KING WILLIAMS TOWN cds. A scarce Inter-Provincial use. CAPE OF GOOD HOPE - 1911 'Inter Provincial' use of Transvaal 1/2d green PSC used at QUEENSTOWN. 1911 (JY.11.) 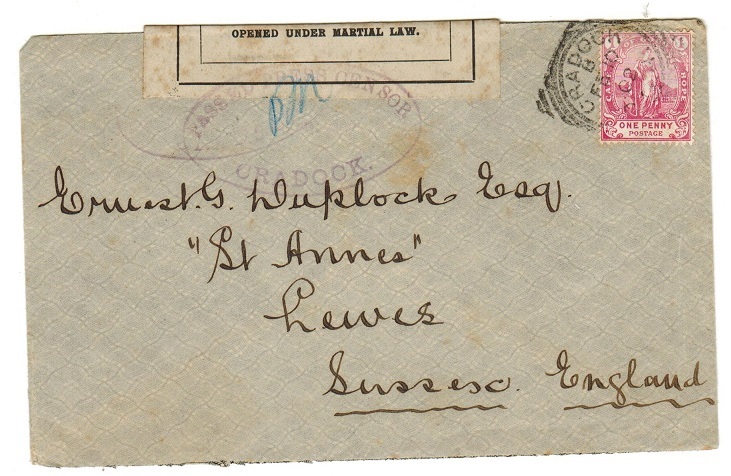 use of Transvaal 1/2d postal stationery postcard (H&G 11) addressed locally cancelled by s/r QUEENSTOWN cds. A scarce Inter-Provincial use. CAPE OF GOOD HOPE - 1910 1d rate postcard use to Belgium used at NQAMAKWE. 1910 (AP.11.) 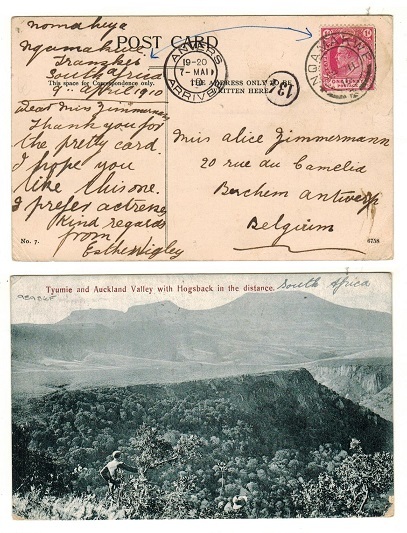 use of picture postcard addressed to Belgium depicting 'Tyumie and Auckland Valley with Hogsback in the distance' bearing 1d adhesive tied NQAMAKWE. CAPE OF GOOD HOPE - 1910 1d rate postcard use to UK used at RIPON/CGH. 1910 (JY.12.) 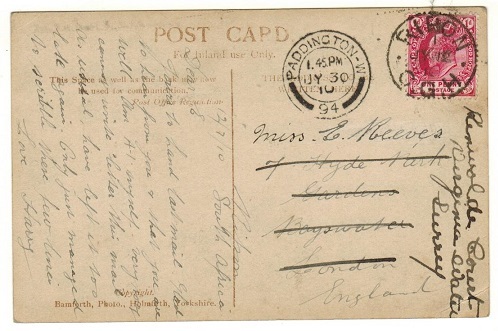 use of picture postcard addressed to UK bearing 1d adhesive tied RIPON/CGH. 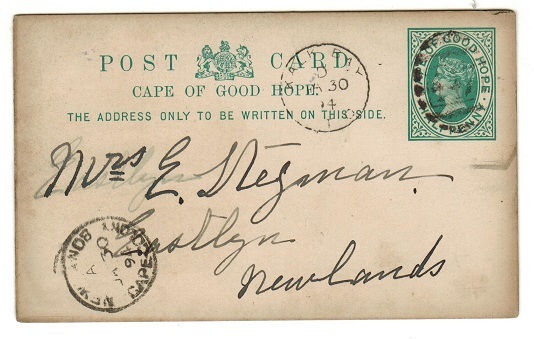 CAPE OF GOOD HOPE - 1898 1/2d green PSRC to Natal (no message) used at KLEIN DRAKENSTEIN. H&G 16. 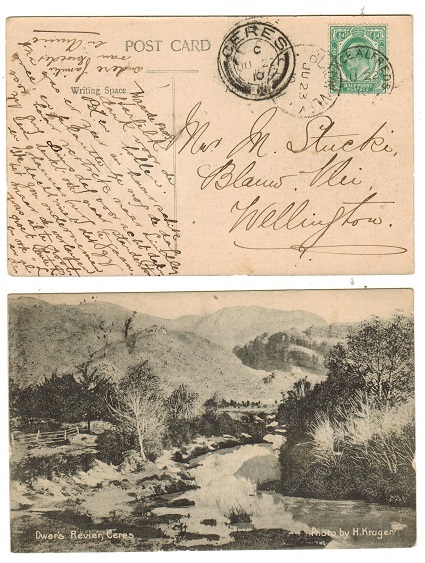 1898 1/2d green outward section of the 1/2d+1/2d postal stationery reply postcard (H&G 16) addressed to Natal (without message) cancelled by s/r KLEIN DRAKENSTEIN cds dated MR.7.05. CAPE OF GOOD HOPE - 1898 (circa) 'A Memoir of the Boer War' illustrated envelope unused. 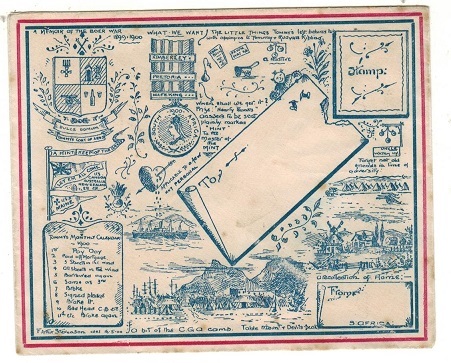 1898 (circa) 'A Memoir of the Boer War' illustrated envelope in unused condition. Odd tone spot on reverse. A scarce envelope. 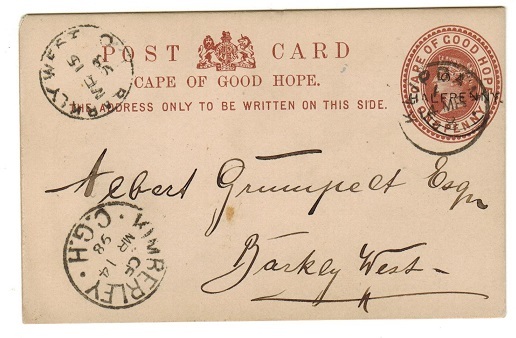 CAPE OF GOOD HOPE - 1898 1d carmine 'Privately Printed' PSC to Germany used at WEST BEAUFORT. 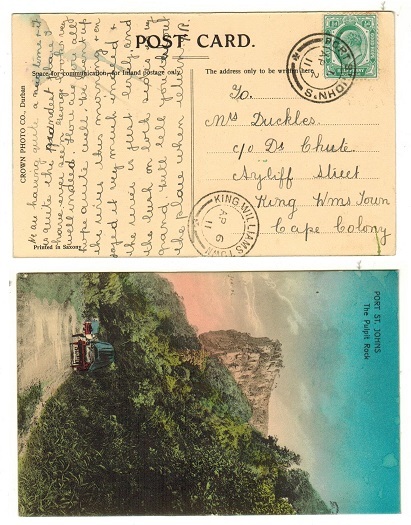 1898 1d carmine on buff postal stationery postcard addressed to Germany with 'Privately Printed' illusatration on reverse side depicting 'Table Mountain from Table Bay' cancelled by WEST BEAUFORT cds dated NO.8.98. H&G 15. 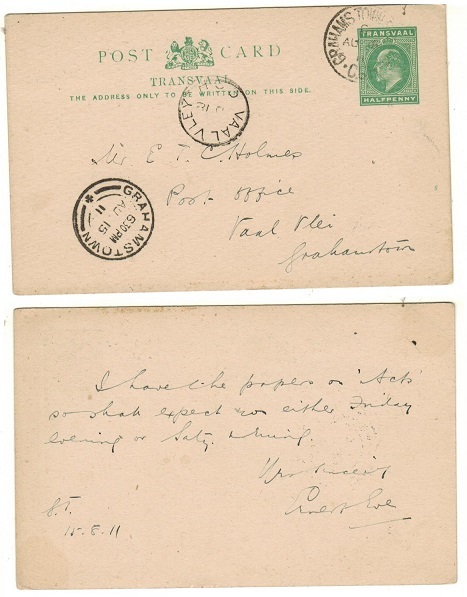 CAPE OF GOOD HOPE - 1912 cover to USA with Transvaal 1/2d and 1d (x2) used at MOUNT FRERE. 1912 (SP.30.) 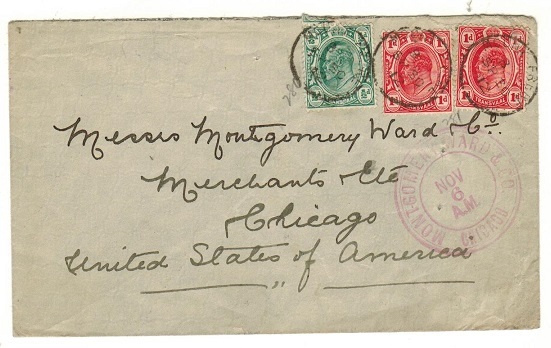 cover addressed to USA bearing Transvaal 1/2d and 1d pair tied by s/r MOUNT FRERE cds. 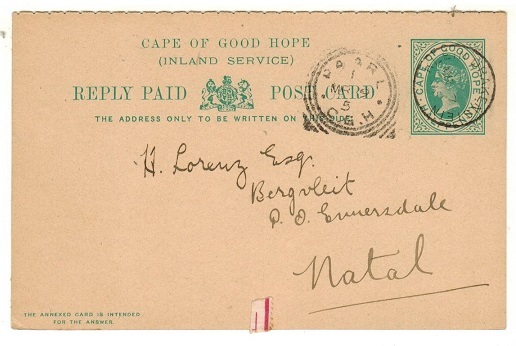 CAPE OF GOOD HOPE - 1912 use of Natal 4d RPSE (tone spots) uprated with Transvaal adhesives. 1912 (OCT.31.) 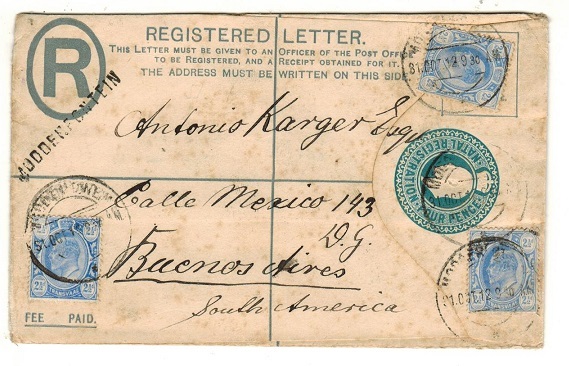 use of 4d blue registered postal stationery envelope of Natal addressed to Argentina (scarce) bearing three examples of the Transvaal 2 1/2d adhesive tied MODDENFONTEIN. Light tone spotting and opened on two sides but a scarce Inter provincial use. CAPE OF GOOD HOPE - 1911 1d rate postcard to UK used at KINGS HILL. 1911 (APR.17.) 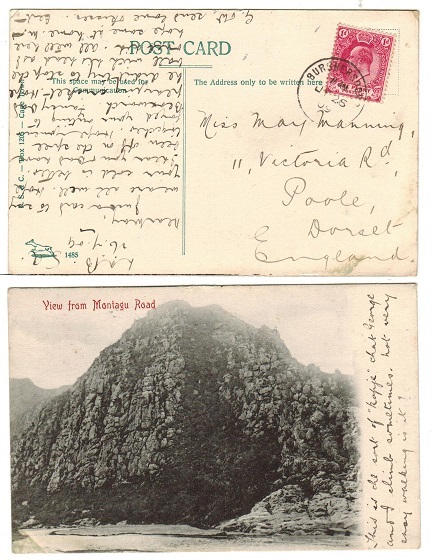 use of picture postcard addressed to UK depicting 'Mont Aux Sources, Drakensberg, Natal' bearing 1d adhesive tied KINGS HILL cds. CAPE OF GOOD HOPE - 1911 1/2d rate local postcard used at PORT ST.JOHN'S. 1911 (AP.2.) 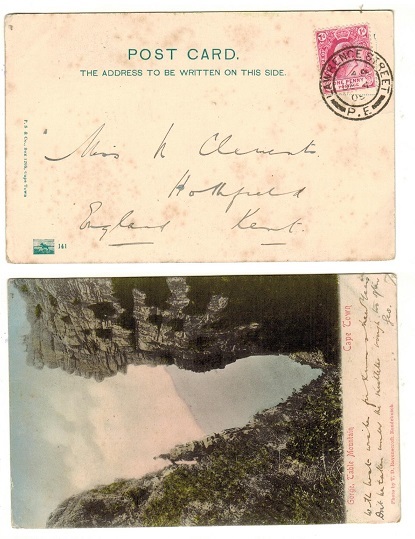 use of picture postcard addressed locally to King Williams Town depicting 'Port St.John's-The Pulpit Rock' bearing 1/2d adhesive tied PORT ST.JOHN'S. CAPE OF GOOD HOPE - 1905 1d rate postcard to UK used at LAWRENCE STREET/P.E. 1905 (DE.4.) 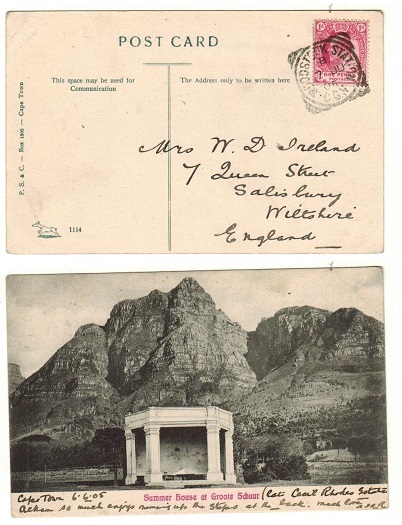 use of picture postcard addressed to UK depicting 'Gorge-Table Mountain' bearing 1d adhesive tied LAWRENCE STREET/P.E. CAPE OF GOOD HOPE (Mafeking) - 1900 FOURNIER strikes of the 'Mafeking 3d & 1/- Besieged' h/s's. 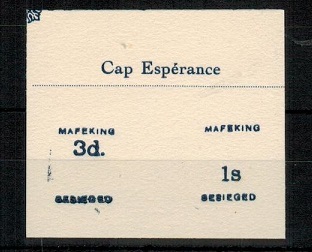 1900 FOURNIER strikes of the 'Mafeking 3d Besieged' and 'Mafeking 1/- Beseiged' handstamps printed in black on cream card taken from the Fournier forgery handbook. CAPE OF GOOD HOPE (Griqualand West) - 1877 range of Fournier 'G' overprints on piece. 1877 range of five different strikes of the FOURNIER 'G' overprint printed in black on cream paper affixed to part of the original Fournier handbook. 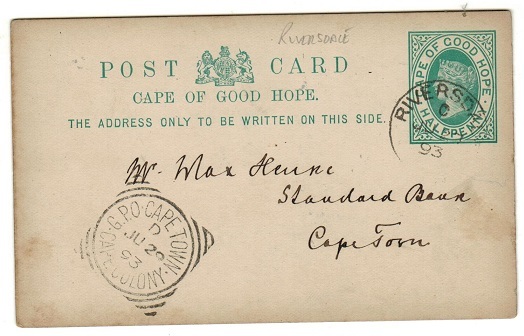 CAPE OF GOOD HOPE - 1911 use of uprated Transvaal 1/2d PSC (H&G 11) to Germany from BETHULIE. 1911 (SEP.25.) 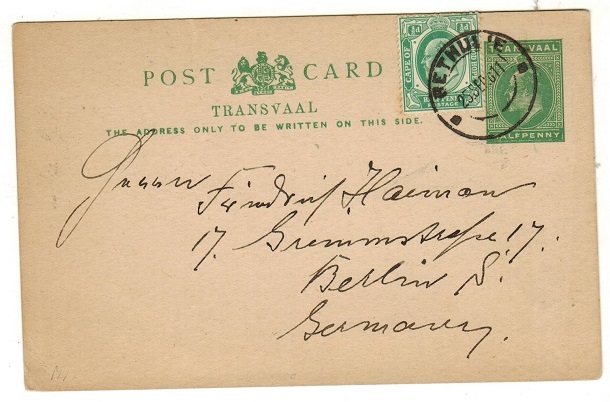 use of Transvaal 1/2d green postal stationery postcard (H&G 11) with Cape 1/2d added addressed to Germany and tied BETHULIE cds. A scarcer 'Inter-Provincial' use. 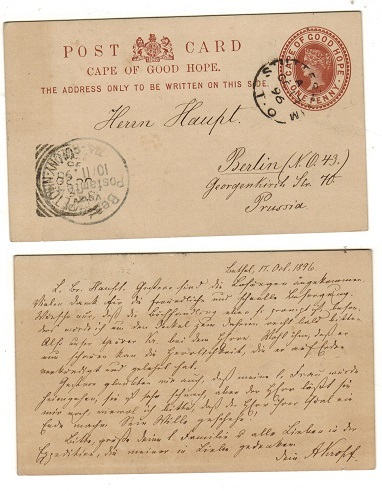 CAPE OF GOOD HOPE - 1882 1d reddish brown PSC to Prussia used at STUTTERHEIM/T.O. H&G 2. 1882 1d reddish brown on white postal stationery postcard addressed to Prussia (scarce) cancelled by scarce STUTTERHEIM/T.O. (Telegraph Office) cds dated oc.17.96. H&G 2. 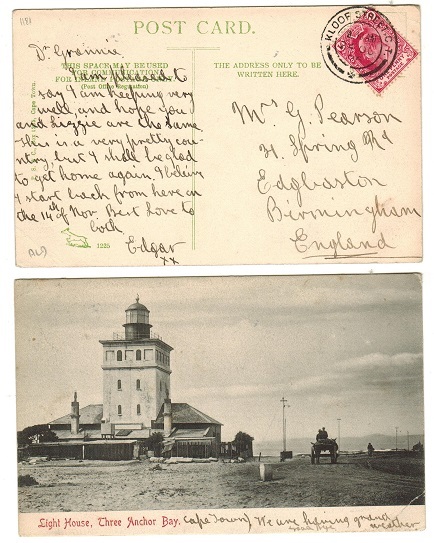 CAPE OF GOD HOPE - 1907 1/2d rate postcard use to Transvaal struck by light KROOMIE SIDING cds. 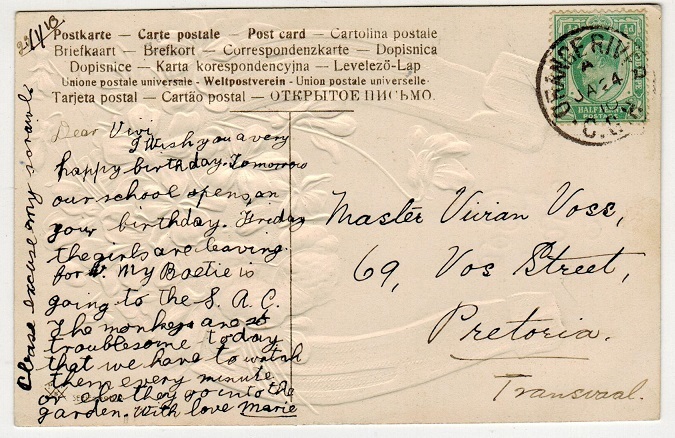 1907 use of postcard addressed to Transvaal depicting 'Oxford Street-East London SA' bearing 1/2d adhesive tied by a light strike of the rare KROOMIE SIDING cds dated MY.27.07 with COOK HOUSE transit cds alongside and FORDSBURG/TRANSVAAL arrival. 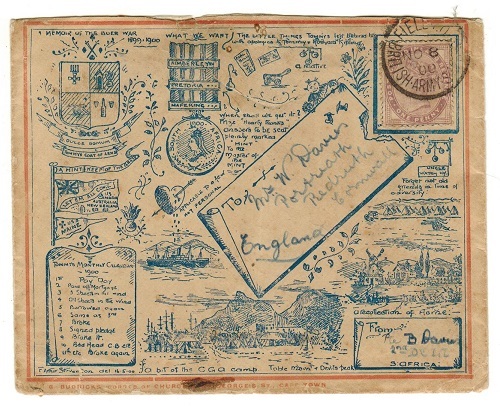 CAPE OF GOOD HOPE - 1849 stampless cover to UK struck by GENERAL POST OFFICE/CAPE TOWN h/s. 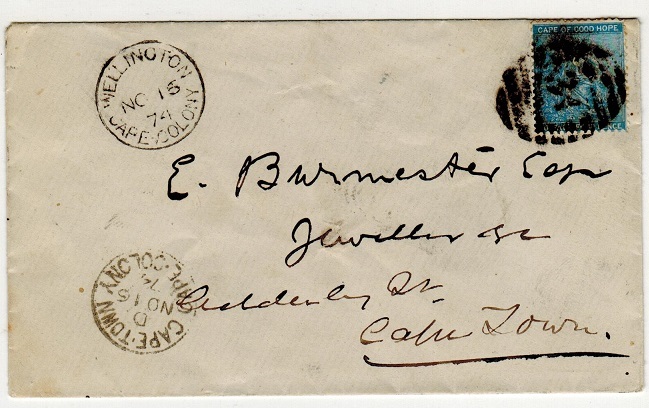 1849 stampless cover rated '8' in manuscript addressed to UK and struck on the front by black oval GENERAL POST OFFICE/CAPE TOWN handstamp. Right hand reverse flap missing. CAPE OF GOOD HOPE - 1893 local 1d rate cover used at SCHOOMBIE. 1893 (AU.22.) 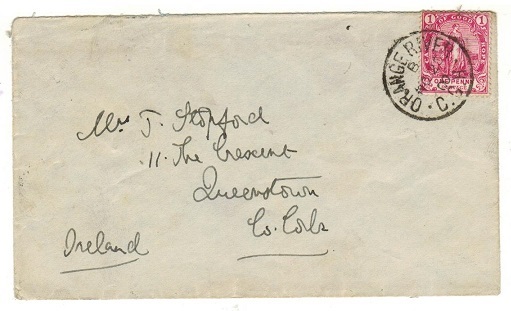 cover addressed to Cape Town bearing 1d adhesive tied SCHOOMBIE/C.G.H. Surface crease but complete with original contents. 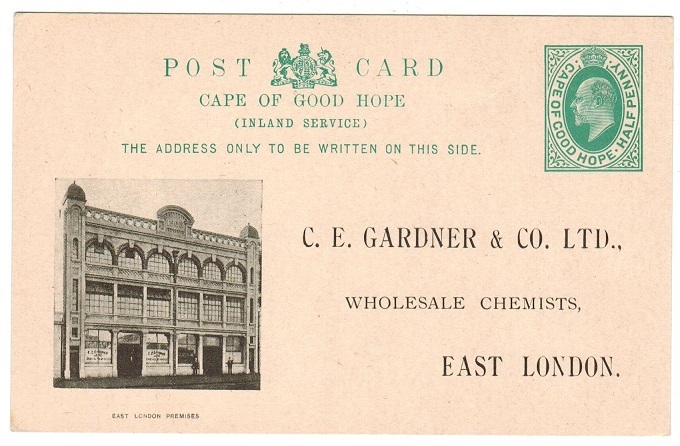 CAPE OF GOOD HOPE - 1903 1/2d green PSC unused privately printed use for 'Gardner & Co. Ltd'. 1903 1/2d green on cream postal stationery postcard (H&G 17a) in unused condition 'Privately Printed' for use by 'C.E.Gardner & Co Ltd' with illustration on front of their premises at East London. CAPE OF GOOD HOPE - 1855 4d deep blue used. SG 6. 1855 4d deep blue on white paper imperforated triangular adhesive cancelled by neatly applied triangular grid cancel. SG 6. CAPE OF GOOD HOPE - 1871 1/2d grey black used with IMPERFORATE RIGHT MARGIN. SG 28. 1871 1/2d grey-black adhesive on 'CC' watermarked paper cancelled by grilled duplex and with part CAPE COLONY cds alongside showing the variety IMPERFORATE TO RIGHT EDGE. Unusual item. SG 28. CAPE OF GOOD HOPE - 1892 2 1/2d olive green PSE to Natal used at SNEEZEWOOD. H&G 3. 1892-94 2 1/2d olive green on glossy straw paper postal stationery envelope addressed to Natal and cancelled by SNEEZEWOOD/C.G.H. cds dated MY.4.96. H&G 3. 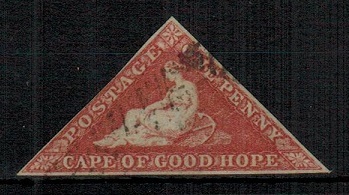 CAPE OF GOOD HOPE - 1820 (circa) 1/- rated outer wrapper struck POST PAID to Cape Town. 1820 (circa) undated outer wrapper addressed to Cape Town marked 'Paid' and rated '1/-' in manuscript and struck by black boxed POST PAID handstamp. 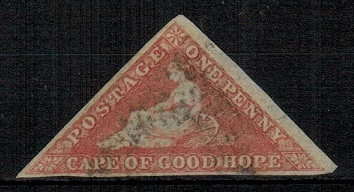 CAPE OF GOOD HOPE - 1836 outer wrapper to Capetown used at UITENHAGEN. 1836 (NO.3.) 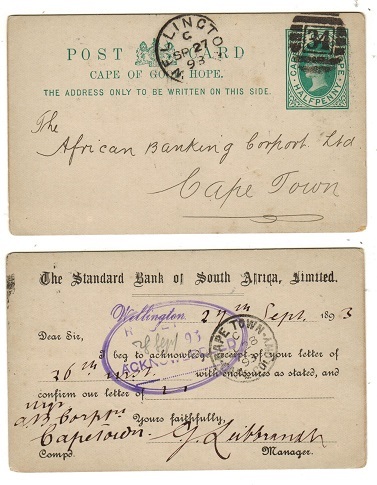 outer wrapper addressed to Cape Town marked '10d Paid' in manuscript with two strike sof the black boxed POST PAID handstamp and struck by light crowned UITENHAGEN handstamp. CAPE OF GOOD HOPE - 1853 4d deep blue on blued paper used. SG 2. 1853 4d deep blue on blued paper in used condition with three clear margins. SG 2. CAPE OF GOOD HOPE - 1900 use of 'Memoir Of The Boer War' cover to UK. 1900 (NO.8.) illustrated 'Memoir Of The Boer War' envelope addressed to UK in soldiers blue pen bearing GB 1d lilac adhesive tied by FIELD P.O./BRITISH ARMY S.AFRICA cds. 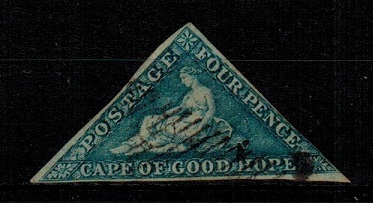 CAPE OF GOOD HOPE - 1863-64 6d steel blue 'triangle' adhesive used. SG 19c. 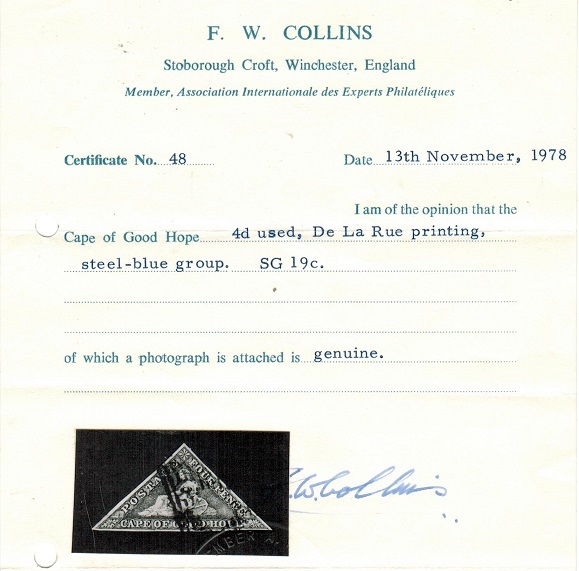 1863-64 6d steel blue 'triangle' adhesive used with three margins and complete with 'F.W.Collins' certificate. SG 19c. 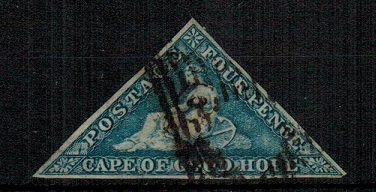 CAPE OF GOOD HOPE - 1863-64 4d blue 'triangle' in used condition. SG 19a. 1863-64 4d blue 'triangle' in used condition. SG 19a. 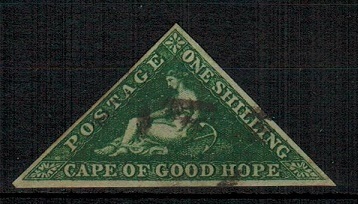 CAPE OF GOOD HOPE - 1855-63 1/- deep dark green 'triangle' adhesive in used condition. SG 8b. 1855-63 1/- deep dark green 'triangle' adhesive in used condition with three clear margins. SG 8b. CAPE OF GOOD HOPE - 1855-63 1/- bright yellow green imperforate 'triangle' fine used. SG 8. 1855-63 1/- bright yellow green imperforate 'triangle' with three clear margins fine used. SG 8. 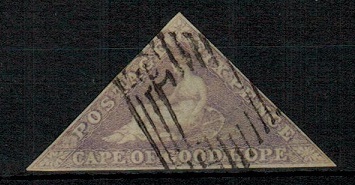 CAPE OF GOOD HOPE - 1855-63 6d pale rose lilac imperforate 'triangle' fine used. SG 7. 1855-63 6d pale rose lilac imperforate 'triangle' with three clear margins fine used. SG 7. CAPE OF GOOD HOPE - 1855-63 1d deep rose-red imperforate 'triangle' fine used. SG 5b. 1855-63 1d deep rose-red imperforate 'triangle' with three clear margins fine used. SG 5b. CAPE OF GOOD HOPE - 1855-63 1d rose imperforate 'triangle' fine used. SG 5a. 1855-63 1d rose imperforate 'triangle' with three clear margins fine used. SG 5a. CAPE OF GOOD HOPE - 1903 1d rate postcard use to Switzerland used at WELLINGTON STATION. CAPE OF GOOD HOPE - 1905 1/2d rate postcard use to UK used at WEST BANK EAST LONDON. 1905 (JY.4.) 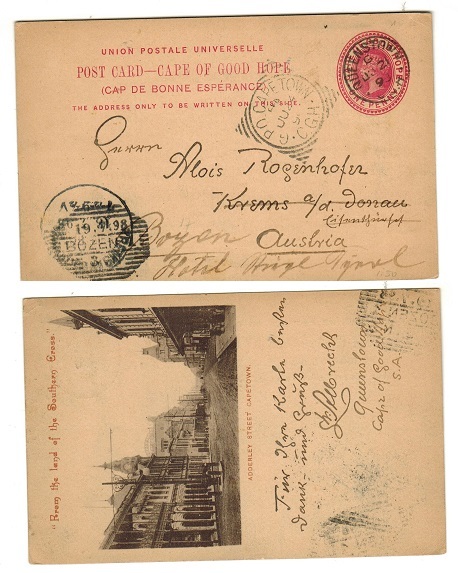 use of picture postcard addressed to UK depicting 'Douglas Street, showing residency- Bloemfontein' bearing 1/2d adhesive tied by d/r WEST BANK EAST LONDON cds. CAPE OF GOOD HOPE - 1910 1/2d rate local postcard used at PRINCE ALBERT STATION. 1910 (JU.22.) 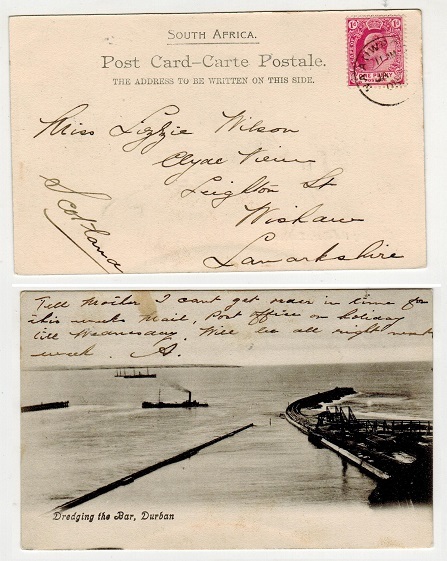 postcard addressed locally depicting 'Dwars Revier, Ceres' and bearing 1/2d adhesive tied by PRINCE ALBERT STATION cds with BLAUW VLEI arrival. 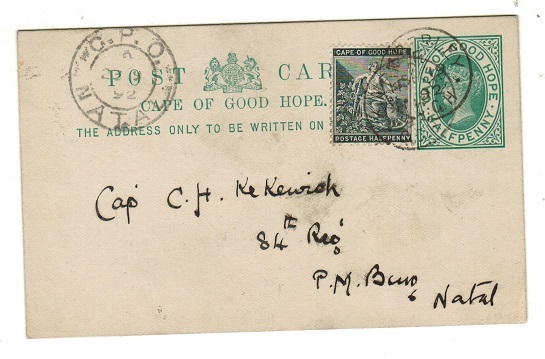 CAPE OF GOOD HOPE - 1892 1/2d green PSC used at WELLINGTON. H&G 5. 1892 1/2d Green on white postal stationery postcard to Capetown & cancelled by '34' duplex with WELLINGTON 'proving' cds alongside dated SP.27.93 code G. The reverse side pre-printed for commercial use. H&G 5. 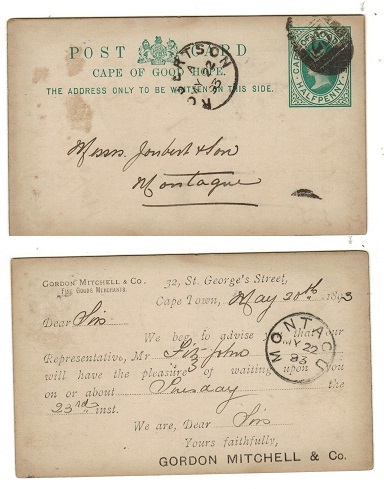 CAPE OF GOOD HOPE - 1892 1/2d green PSC used at RONDEBOSCH. H&G 5. 1892 1/2d green on white postal stationery postcard addressed locally and cancelled by duplex cancel with RONDEBOSCH cds alongside dated MR.23.93 (code J). H&G 5. 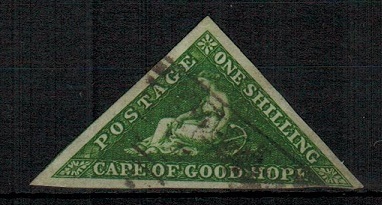 CAPE OF GOOD HOPE - 1892 1/2d green PSC used at ROBERTSON. H&G 5. 1892 1/2d green on white postal stationery postcard addressed locally and cancelled by '25' duplex with ROBERTSON 'proving' cds alongside dated MY.22.93. The reverse side pre-printed for commercial use. H&G 5. 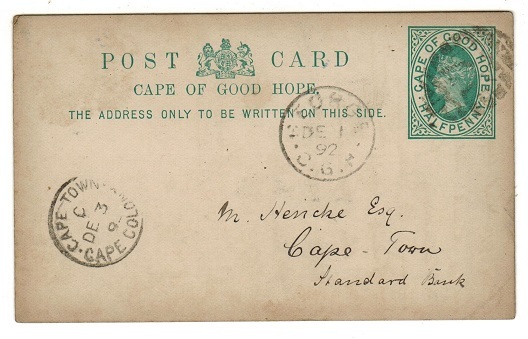 CAPE OF GOOD HOPE - 1892 1/2d green PSC used at RIVERSDALE. H&G 5. 1892 1/2d green on white postal stationery postcard addressed locally (a little aged) cancelled by RIVERSDALE cds dated JU.27.93. H&G 5. CAPE OF GOOD HOPE - 1892 1/2d green PSC used at PORT ELIZABETH. H&G 5. 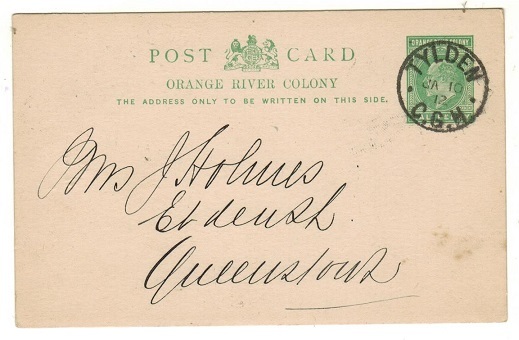 1892 1/2d green on white postal stationery postcard addressed locally & cancelled PORT ELIZABETH & dated OC.8.95. H&G 5. 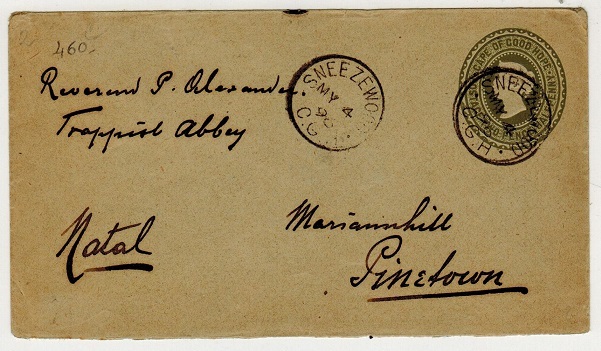 CAPE OF GOOD HOPE - 1892 1/2d green PSC used at MALMESBURY. H&G 5. 1892 1/2d green on white postal stationery postcard addressed locally and cancelled by '215' duplex with MALMESBURY 'proving' cds alongside dated MR.3.94. H&G 5. 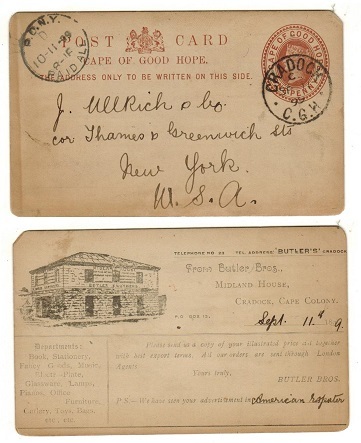 CAPE OF GOOD HOPE - 1903 1/2d green PSC to Germany uprated at COOKHOUSE. H&G 17. 1903 1/2d green on cream postal stationery postcard addressed to Germany uprated with additional 1/2d green and tied by s/r COOKHOUSE cds dated MY.11.04. H&G 17. CAPE OF GOOD HOPE - 1892 1/2d green PSC used locally and uprated at KIMBERLEY. H&G 5. 1892 1/2d green on white postal stationery postcard addressed to Natal bearing additional 1/2d adhesive & tied KIMBERLEY & dated SP.9.92. H&G 5. 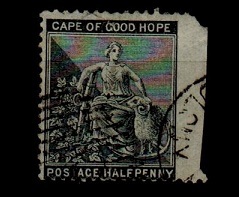 CAPE OF GOOD HOPE - 1892 1/2d green PSC used locally from KALK BAY. H&G 5. 1892 1/2d green on white postal stationery postcard addressed locally and cancelled by light '447' duplex with KALK BAY 'proving' cds alongside dated JA.30.94. H&G 5. 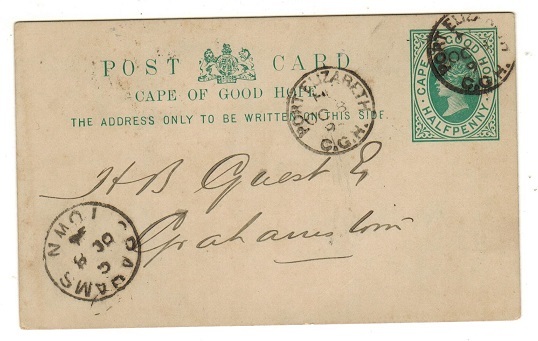 CAPE OF GOOD HOPE - 18912 1/2d green PSC used locally from GEORGE. H&G 5. 1892 1/2d green on white postal stationery postcard addressed locally and cancelled by duplex cancel with GEORGE cds alongside dated DE.1.92. H&G 5. 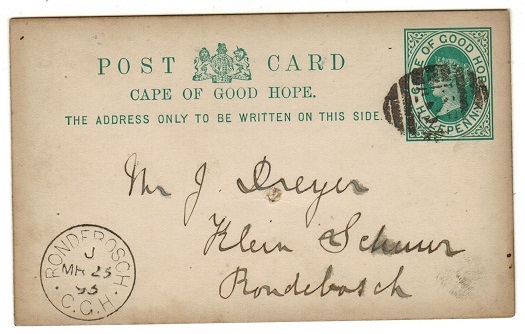 CAPE OF GOOD HOPE - 1892 1/2d green PSC from KIMBERLEY with RETURNED LETTER/CAPETOWN strike. H&G 5. 1892 1/2d green on white postal stationery postcard addressed locally & cancelled KIMBERLEY & dated JY.28.96 with 'FG' code. The reverse shows large part of the RETURNED LETTER/ CAPETOWN cds. H&G 5. 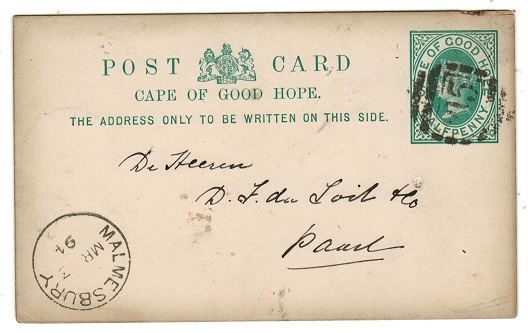 CAPE OF GOOD HOPE - 1892 1/2d green PSC used locally from BATHURST. H&G 5. 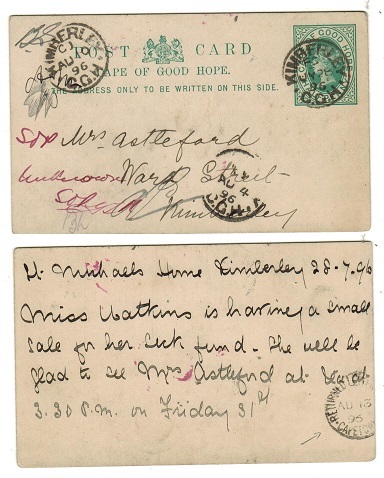 1892 1/2d green on white postal stationery postcard addressed locally (a little aged) cancelled by BATHURST cds dated DE.21.94. H&G 5. CAPE OF GOOD HOPE - 1898 1d carmine 'private printed' illustrated PSC used at QUEENSTOWN. H&G 15. 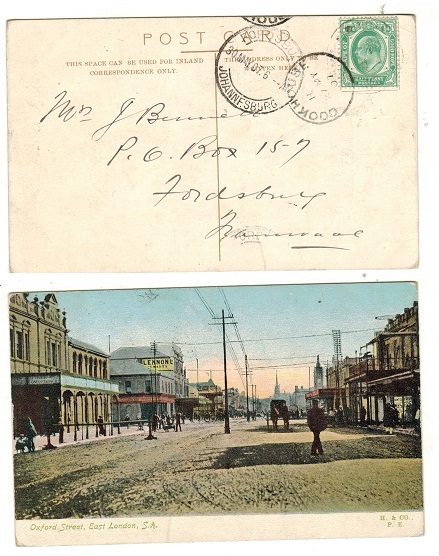 1898-1901 1d carmine on cream postal stationery postcard addressed to Austria of the privately printed issue (Southern Cross) depicting 'Adderley Street-Cape Town' cancelled by s/r QUEENSTOWN/CGH cds dated JU.21.98. H&G 15. 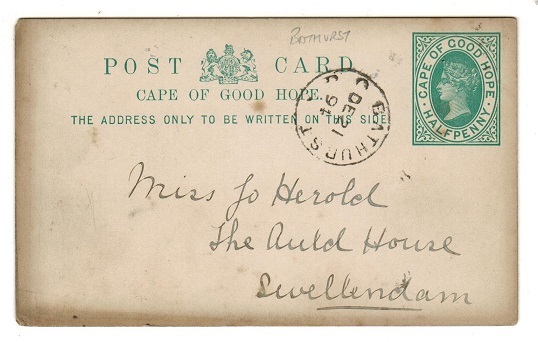 CAPE OF GOOD HOPE - 1891 1d rate local cover struck by '35' duplex from RONDERBOSCH. 1891 (NO.4.) 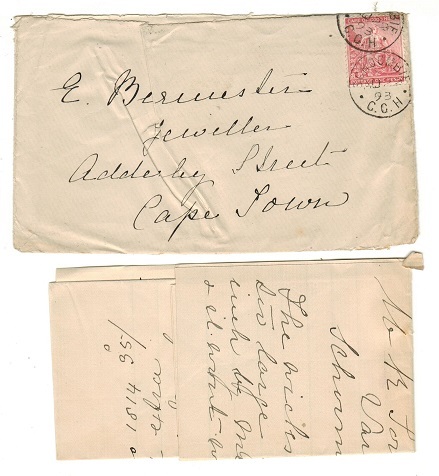 cover addressed to Cape Town bearing 1d adhesive tied by '35' duplex with RONDERBOSCH/CAPE COLONY 'proving' cds alongside. 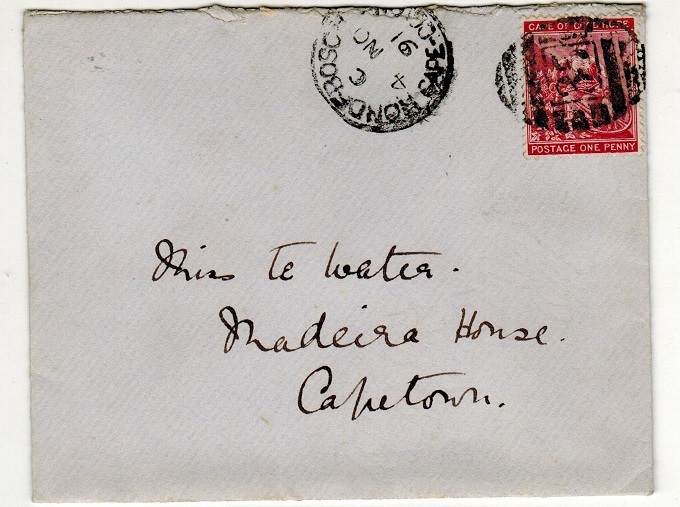 CAPE OF GOOD HOPE - 1874 4d rate local cover struck by '34' duplex from WELLINGTON. 1874 (NO.16.) 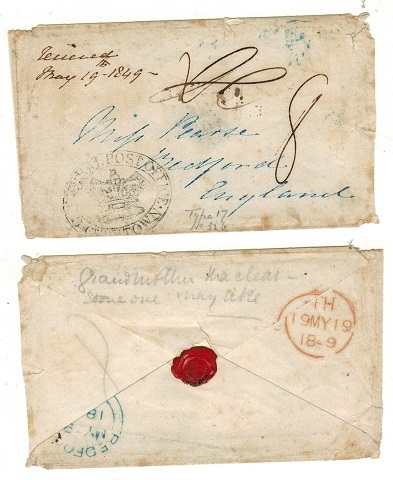 cover addressed to Cape Town bearing 4d blue adhesive tied by '34' duplex with WELLINGTON/CAPE COLONY 'proving' cds alongside. 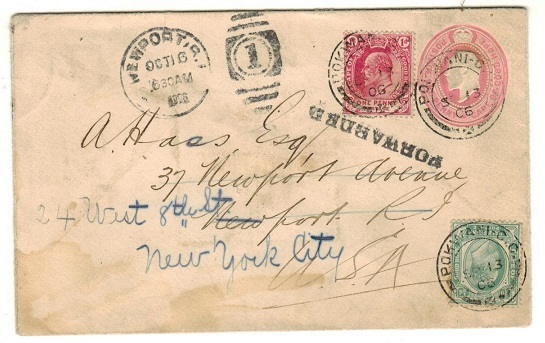 CAPE OF GOOD HOPE - 1874 4d rate local cover struck by '18' duplex from GRAAF REINER. 1874 (NO.8.) 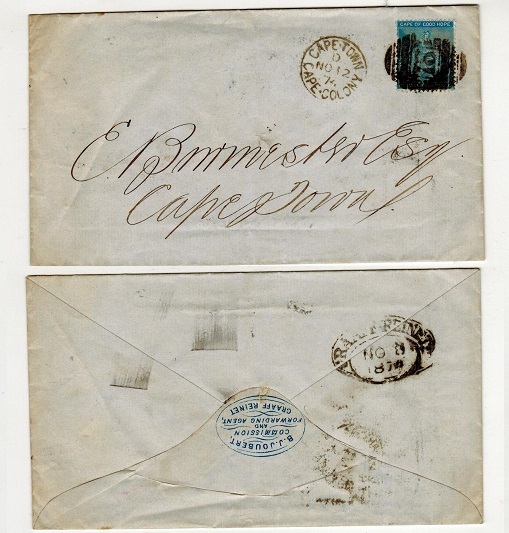 cover addressed to Cape Town bearing 4d blue adhesive tied by '18' duplex with oval GRAAF REINER 'proving' b/s and CAPE TOWN arrival on front dated NO.12.74. CAPE OF GOOD HOPE - 1894 1/2d on 1d brownish red PSC used at KLIPDAM. H&G 8. 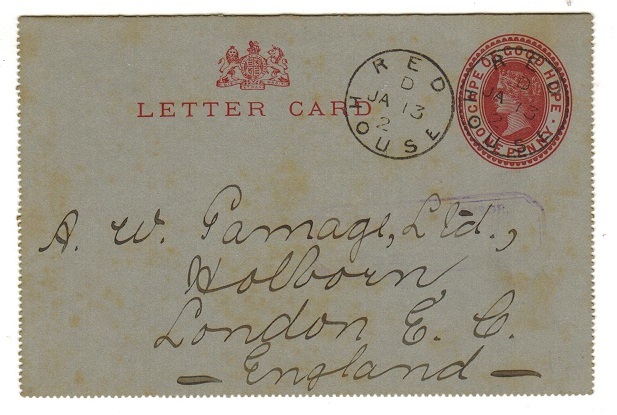 1894 HALFPENNY black on 1d brownish red on cream postal stationery postcard addressed to Barkley West and cancelled by KLIPDAM cds dated 14.MR.98. H&G 8. 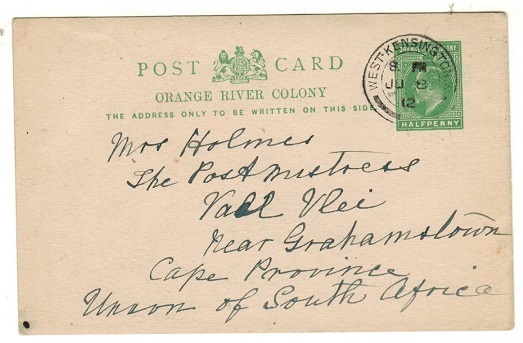 CAPE OF GOOD HOPE - 1895 1d carmine stationery letter card to UK used at RED HOUSE. H&G 1. 1895 1d carmine on grey postal stationery letter card addressed to UK (affected by light tone marks all over) cancelled by scarce s/r RED HOUSE cds dated JA.13.02. H&G 1. 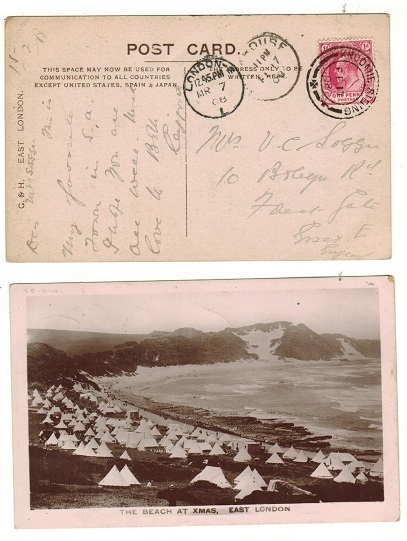 CAPE OF GOOD HOPE - 1906 1d rate postcard to France used at WEST BANK EAST LONDON. 1906 (MY.14) picture postcard to France depicting natives 'Three Dandies' bearing Cape 1d adhesive tied by d/r WEST BANK EAST LONDON cds. CAPE OF GOOD HOPE - 1906 1d rate postcard to Switzerland used at WELLINGTON STATION. 1906 (NO.7.) 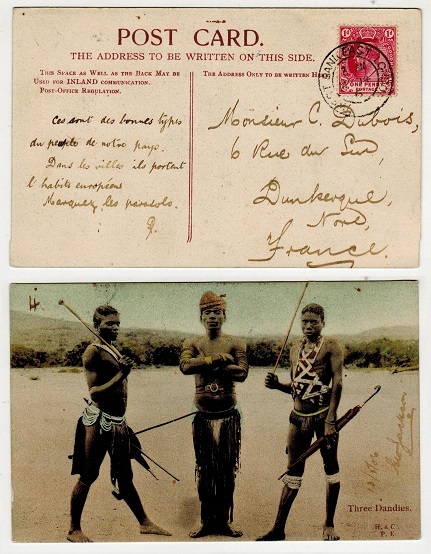 use of picture postcard addressed to Switzerland depicting 'Matoppo Bill (Rhodesia)' bearing 1d adhesive tied by the (narrow type) d/r WELLINGTON STATION cds. CAPE OF GOOD HOPE - 1907 1d rate postcard to UK used at WALMER. 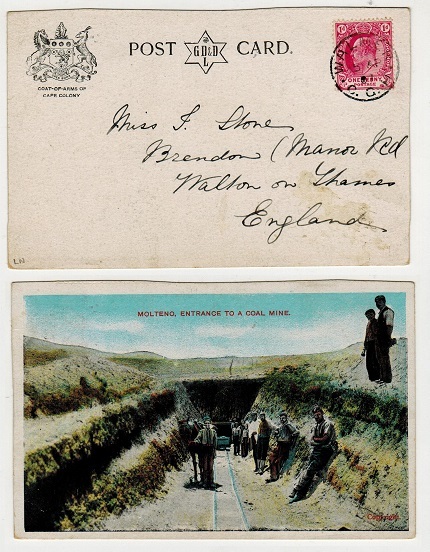 1907 (AP.15) use of picture postcard to UK depicting 'Molteng Entrance to Coal Mine' bearing 1d adhesive tied by s/r WALMER/C.G.H. cds. CAPE OF GOOD HOPE - 1906 1d rate postcard to UK used at UMTATA. 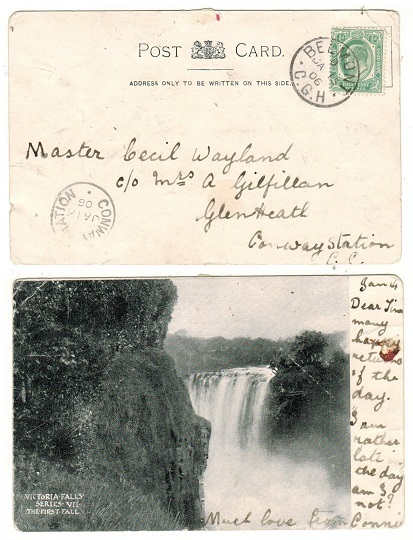 1906 (NO.17) use of picture postcard to UK depicting 'I'sita Falls at Pondoland' bearing 1d adhesive tied by UMTATA cds. A fine Transkei village strike. CAPE OF GOOD HOPE - 1908 1d rate postcard to UK used at STELLENBOSCH. 1908 (NO.11.) 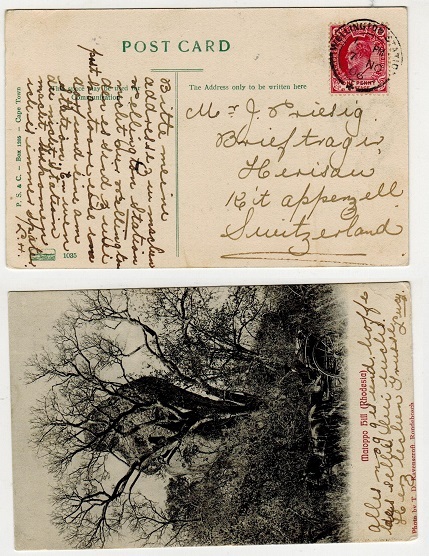 use of picture postcard addressed to UK bearing 1/2d adhesive tied by STELLENBOSCH cds. CAPE OF GOOD HOPE - 1905 1d rate postcard to UK used at ST.MARKS. 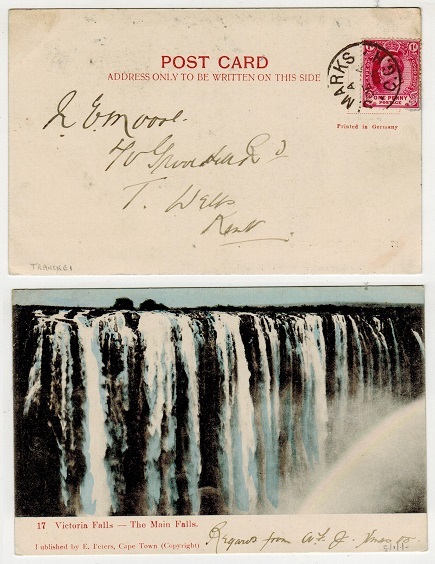 1905 (DE.4) use of picture postcard to UK depicting 'Victoria Falls - The Main Falls' bearing 1d adhesive tied by ST.MARKS/C.G.H. cds from the Transkei. 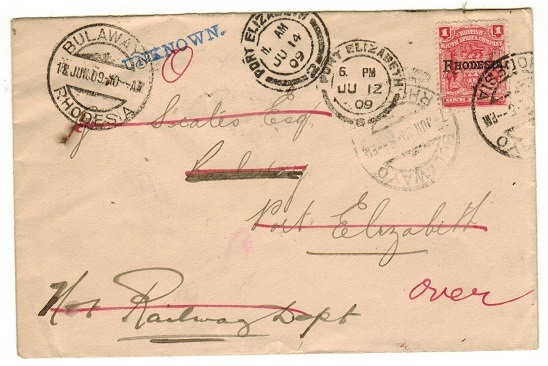 CAPE OF GOOD HOPE - 1903 1d pink PSE to UK with scarce 'C CROWN C' roller strike. H&G 5b. 1903 1d pink on heavy laid cream paper postal stationery envelope with curved flap (H&G 5b) addressed to UK (central fold) cancelled by the scarce CAPE TOWN - C CROWN C roller strike dated DEC.5.1906. 1903 1/2d green on cream postal stationery postcard addressed locally to Conway cancelled by SCHOOMBIE/CGH cds dated MY.19.08 with a short message on reverse regarding a chess move. Part CONWAY STATION arrival the following day. H&G 17a. CAPE OF GOOD HOPE - 1906 1/2d local rate postcard to Cape Town used at SOMERSET STRAND. 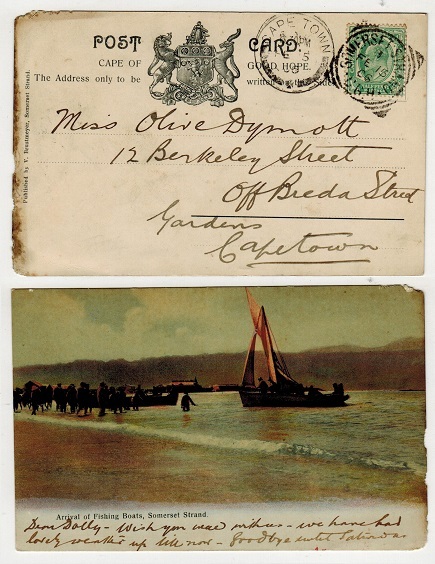 1906 (FE.15) use of picture postcard addressed locally to Cape Town depicting `Arrival of Fishing Boats, Somerset Strand' & bearing 1/2d adhesive tied by squared circle SOMERSET STRAND/ CGH cancel. CAPE OF GOOD HOPE - 1911 1/2d local rate postcard to Cape Town used at RIEBECK EAST. 1911 (JA.1.) 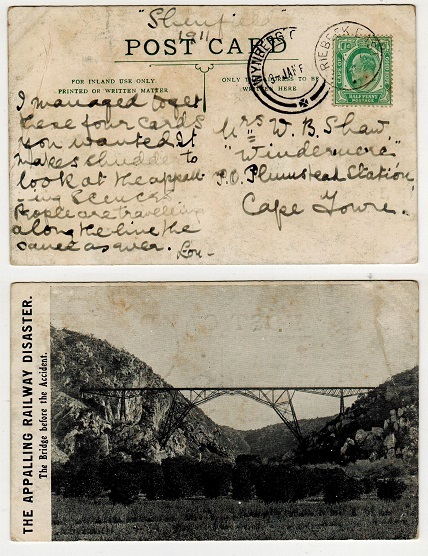 use of picture postcard addressed to Cape Town depicting 'The appalling railway disaster/the bridge before the accident' bearing 1/2d adhesive tied by RIEBECK EAST cds. CAPE OF GOOD HOPE - 1905 (circa) 1d rate postcard to UK used at OUDTSHOORN. 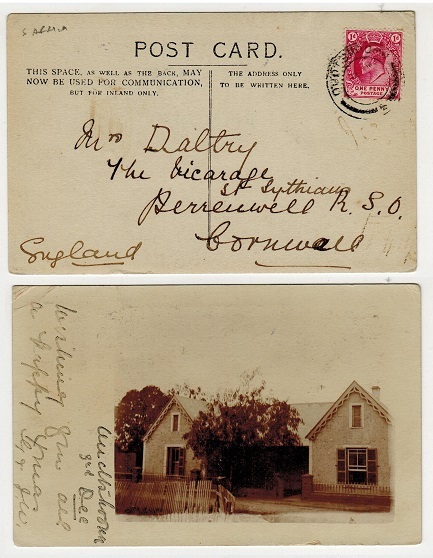 1905 (circa) use of picture postcard addressed to UK depicting a real photo of a house bearing 1d adhesive tied by OUDTSHOORN cds with the date slugs to weak to read. CAPE OF GOOD HOPE - 1910 1/2d local rate postcard use to Pretoria used at ORANGE RIVER. 1910 (JA.24.) 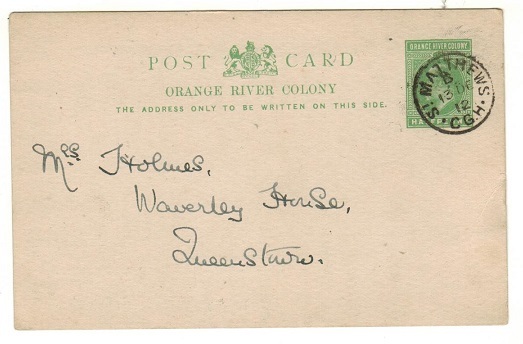 use of picture postcard addressed to Pretoria bearing 1/2d green adhesive tied by ORANGE RIVER/C.G.H. cds. CAPE OF GOOD HOPE - 1905 1d rate postcard to UK used at NAAUWPOORT. 1905 (JA.3) use of picture postcard to UK depicting 'Dredging the bar, Durban' and bearing 1d adhesive tied by s/r NAAUWPOORT cds. CAPE OF GOOD HOPE - 1909 1d rate postcard to UK used at BURGHERSDORP. 1909 (JY.26.) use of picture postcard addressed to UK depicting 'View from Montagu Road' bearing 1d adhesive tied by s/r (small lettered) BURGHERSDORP cds. CAPE OF GOOD HOPE - 1909 1d rate postcard to USA used at CLAREMONT. 1909 (OC.6.) 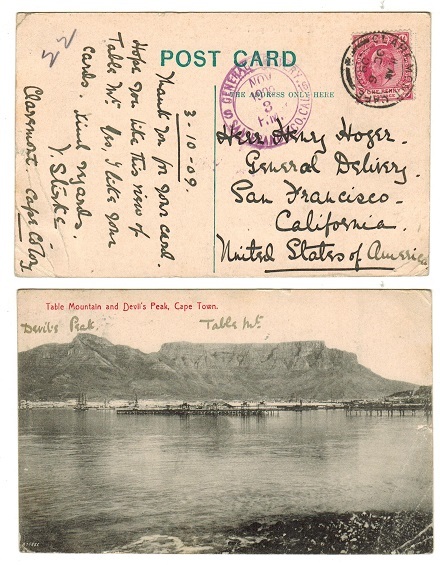 use of picture postcard addressed to USA depicting 'Table Mountain and Devils Peak' bearing 1d adhesive tied by CLAREMONT. CAPE d/r cds. CAPE OF GOOD HOPE - 1907 1d rate postcard to UK used at DIEP RIVER. 1907 (DE.4.) use of Tenerife picture postcard addressed to UK bearing Cape 1d tied by s/r DIEP RIVER/C.G.H. cds. CAPE OF GOOD HOPE - 1910 1d rate postcard to UK used at GORDONS BAY. 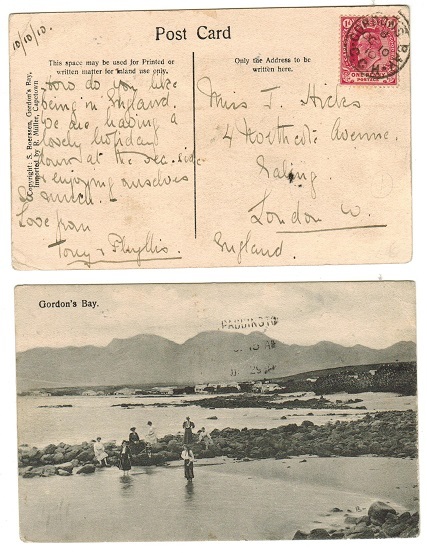 1910 (OC.10) use of picture postcard to UK depicting 'Gordons Bay' bearing 1d adhesive tied GORDONS BAY/C.G.H. cds. CAPE OF GOOD HOPE - 1906 1d rate postcard to UK used at GRAHAMS TOWN STATION. 1906 (AP.16.) 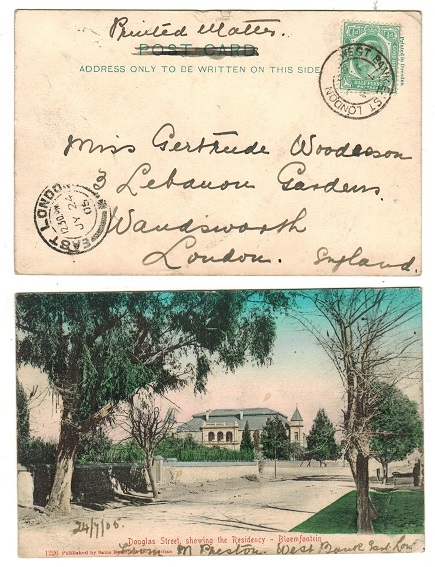 use of picture postcard addressed to UK depicting 'Groote Schuur, Gardens' (Rondebosch) bearing 1d adhesive tied by GRAHAMS TOWN STATION/C.G.H. cds. CAPE OF GOOD HOPE - 1906 1d rate postcard to UK used at KLOOF STREET C.T. 1906 (OC.24) use of picture postcard addressed to UK depicting 'Light House, Three Anchor Bay' bearing Cape 1d adhesive tied by KLOOF STREET C.T. cds. CAPE OF GOOD HOPE - 1905 1d rate postcard use to Ireland used at KIMGHA. 1905 (DE.2.) 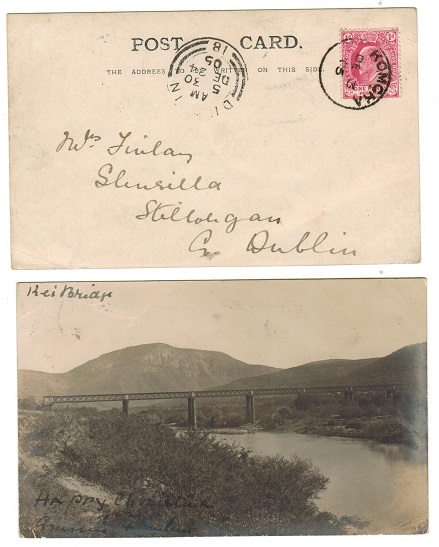 use of picture postcard addressed to Ireland depicting a real photo of 'Kei Bridge' bearing 1d adhesive tied KOMGHA cds. CAPE OF GOOD HOPE - 1907 internal 1/2d rate postcard use used at MOSSELL BAY. 1907 (NO.26.) 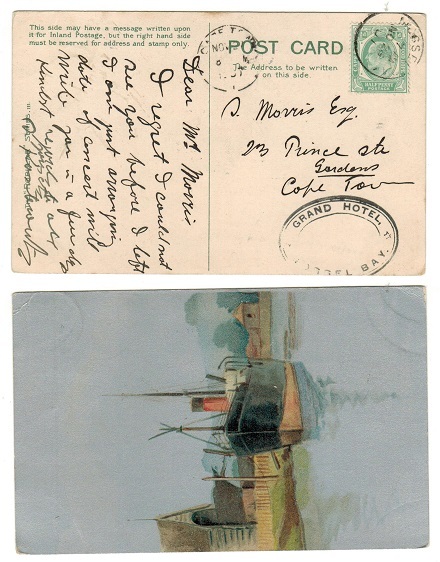 use of picture postcard addressed to Cape Town depicting 'ship in harbour' bearing 1/2d adhesive tied by MOSSELL BAY cds with ovale GRAND HOTEL/MOSSELL BAY cachet at lower right. CAPE OF GOOD HOPE - 1905 1d rate postcard to UK used at MATATIELE. 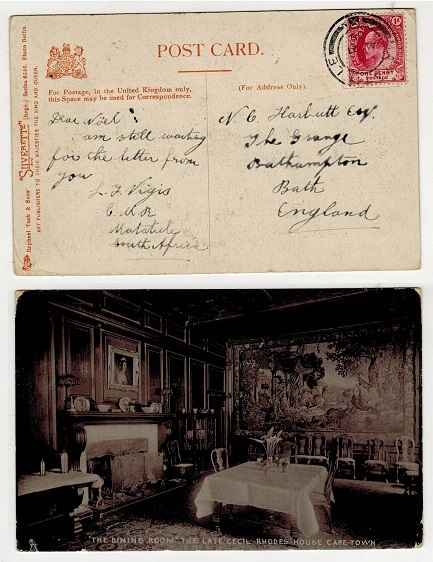 1905 (AU.21) use of picture postcard to UK depicting 'The dining room of the late Cecil Rhodes house, Cape Town' & bearing 1d adhesive tied by MATATIELE cds. CAPE OF GOOD HOPE - 1902 1d rate cover to UK with Boer War censor label and CRADDOCK h/s. 1902 (FE.10.) cover addressed to UK bearing 1d 'Hope' adhesive tied by squared circle CRADOCK cds with black on white OPENED UNDER MARTIAL LAW censor label applied at top edge and tied on the front by violet oval PASSED PRESS CENSOR/CRADOCK h/s. 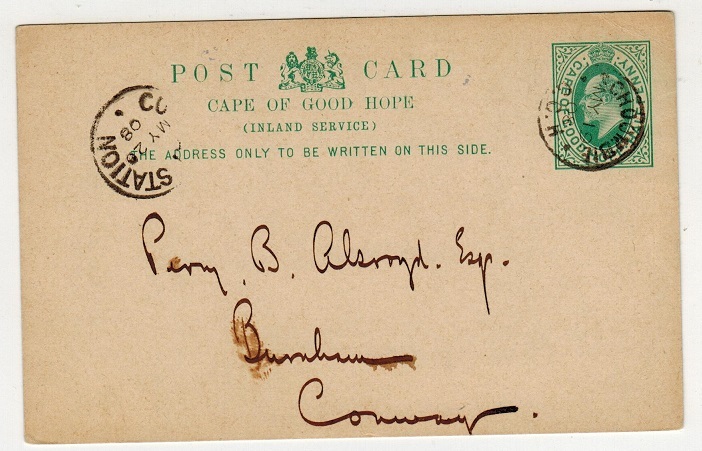 CAPE OF GOOD HOPE - 1906 1/2d rate postcard use to Transvaal used at BLANEY JUNCTION. 1906 (NO.25.) 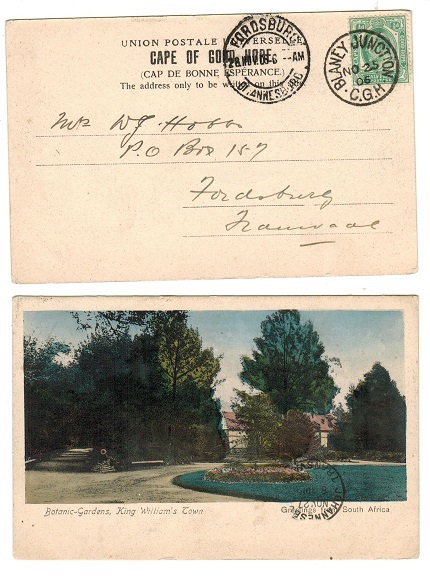 use of picture postcard addressed to Transvaal depicting 'Botanical Gardens at Kings William Town' bearing 1/2d green adhesive tied BLANEY JUNCTION/CGH cds.